According to my knowledge, a major version change occurs when there are major changes or additions to a software. But the Chromium project seems to disagree as they just jumped to version 4.0.201.1 and the only additions they have from version 3.0.197.11 is Bookmarks Syncing to your Google Docs. Seems very much illogical to me why they would do such a thing. I mean the public channel is still on Version 2 and whatâ€™s even more depressing is that it still doesnâ€™t have good developer support for extensions like Firefox has which is still at Version 3.7 according to its latest pre-alpha builds. I guess the Chromium team just think that they can beat the likes of Firefox by boasting a higher version number (which usually means a bigger feature set) like Internet Explorer or Opera (ouch). Its either that or they increment the major version before adding major new features. If its the later, we can expect to see some more welcoming additions into the browser, like support for addons. Oh and if youâ€™re wondering, the Bookmark Sync works only when you launch the browser with â€“enable-sync command line arguments. All you have to do is hit the Wrench icon and select Sync My Bookmarksâ€¦ from the menu. 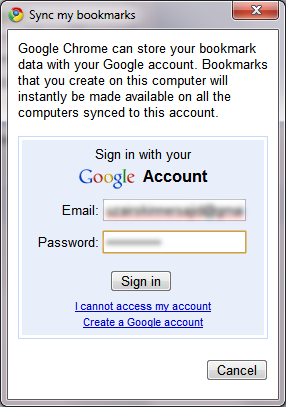 Log in with your Google account and youâ€™re all set. It would have been nice if it could sync with Xmarks too. Would become sort of an universal cloud bookmark sync solution. You can download the latest developer build from here. Ran 17 queries in 0.153 seconds.